Home Google Doodle Google Tricks Google Adapts Its Search for London 2012 Olympics. Google Adapts Its Search for London 2012 Olympics. Google has again surprised us all by integrating Google Search and mostly Wikipedia information to give more meaningful search results for London Olympics 2012. Here are some of the Olympic related updates from Google. 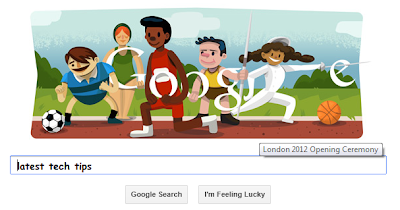 Google has posted a very cool doodle to celebrate the opening ceremony of London Olympics. Looks like Google will update a Doodle frequently specially during Olympics. Just type "Olympics" in Google search and you will be presented with Olympics schedule at the right side of search results. Of course the results are from Wikipedia and Google will also integrate them with Google Ads going forward for sure. Just type "country name Olympics"example "USA Olympics". Google will present to you the latest medals tally for that country. 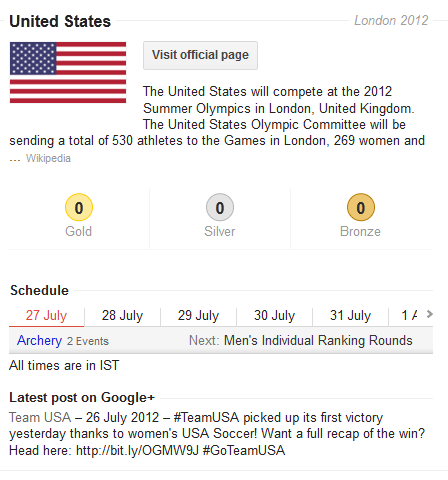 This way you can easily find out Olympics medal tally for USA or any country participating in London Olympics. I will keep updating as and when new tricks are discovered.